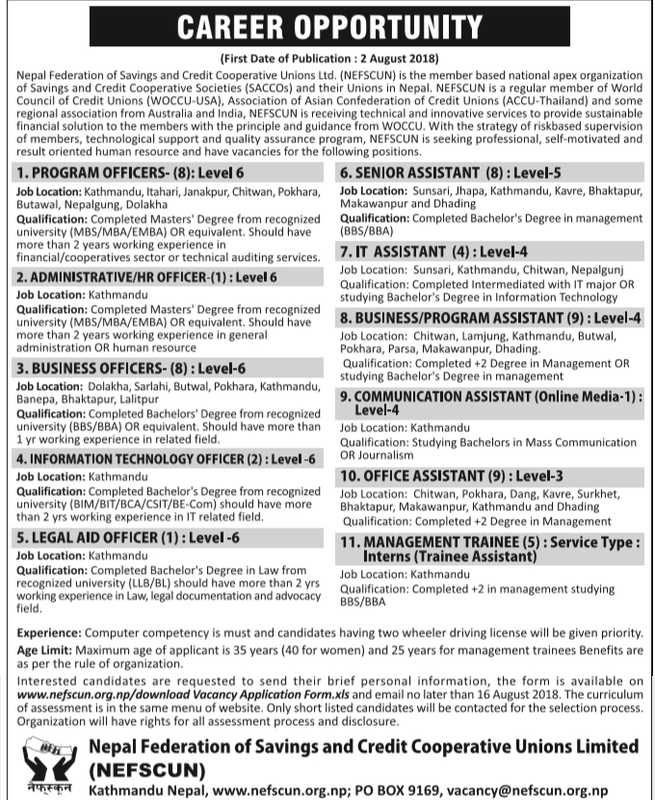 To expand need based and decentralized services, NEFSCUN has vacancies and is seeking self motivated, energetic and result oriented candidates for the following positions. > Qualification: Completed Masters’ Degree from recognized university (MBS/ MBA/ EMBA) OR equivalent, should have more than 2 years working experience in financial/cooperatives sector or technical auditing services. > Qualification: Completed Bachelors’ Degree from recognized university (BBs/BBA) or equivalent, Should have more than 1 yr working experience in related field. > Qualification: Completed Bachelor’s Degree from recognized university (BIM/BIT/CSIT/BE-Com) should have more than 2 years working experience in IT related field. > Qualification: Completed Bachelor’s Degree in Law from recognized university (LLB/BL) should have more than 2 yrs working experience in Law, legal documentation and advocacy field. > Qualification: Completed Intermediated with IT major OR studying Bachelor’s Degree in Information Technology. > Job Location: Chitwan, Lamjung, Kathmandu, Butwal, Pokhara, Parsa, Makwanpur, Dhading. > Qualification: Completed +2 Degree in Management OR studying Bachelor’s Degree in management. > Experience: Computer competency is must and candidates having two wheeler driving license will be given priority. > Age Limit: Maximum age of applicant is 35 years (40 for women) and 25 years for management trainees Benefits are as per the rule of organization. Interested candidates are requested to send their brief personal information, the form is available on www.nefscun.org.np/download Vacancy Application From.xis and email no later than 16 August 2018. The curriculum of assessment is in the same menu of website. Only shortlisted candidates will be contacted for the selection process. Organization will have rights for all assessment process and disclosure.